Cleaning a porcelain sink properly keeps it looking like new even if it is generations old. Instead of harsh chemicals, use mild homemade cleaning solutions that excel at keeping porcelain clean, bright and stain-free. Whenever possible, use the mildest abrasives possible on that porcelain to help prevent scratches. Baking soda qualifies as a mild abrasive; it's also inexpensive and doesn't contain harsh, strong-smelling chemicals. Pat the sink mostly dry, if it's wet, and then sprinkle baking soda liberally all over the sink. 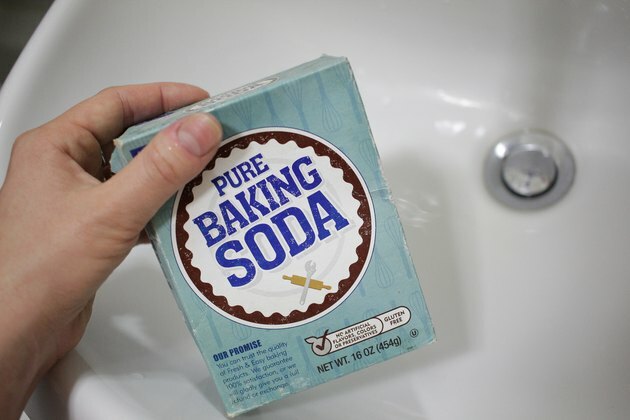 Scrub the baking soda with a nylon scrub pad. If it isn't doing much, wet one corner of the scrub pad; don't soak it or the baking soda may dissolve and lose its abrasive power. As the baking soda cleans, it forms lumps that contain some of the residue that previously stuck to the sink. Rinse the sink out, and pat it dry. 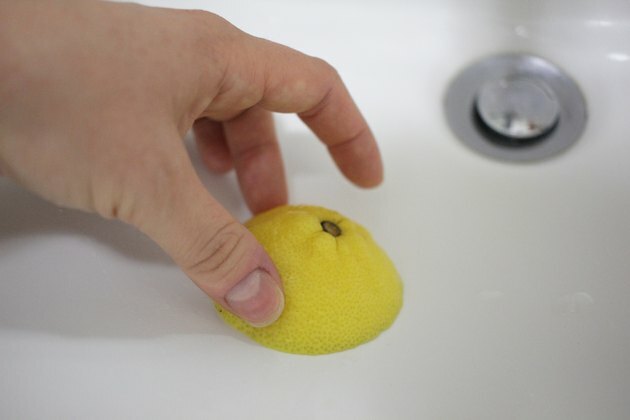 Rub lemon wedges over any remaining stains or spots you see, allowing the lemon juice to sit for 30 minutes or longer before you rinse the sink out. A homemade stain remover takes care of all kinds of stubborn stains on the porcelain -- even rust. Make a paste from 1 part lemon juice, 4 parts borax. Wet the inside the of the sink, and then rub the stained area with a sponge or cloth dipped into the borax paste. Rinse the area off and reapply the paste, if necessary, rinsing the sink again afterward. 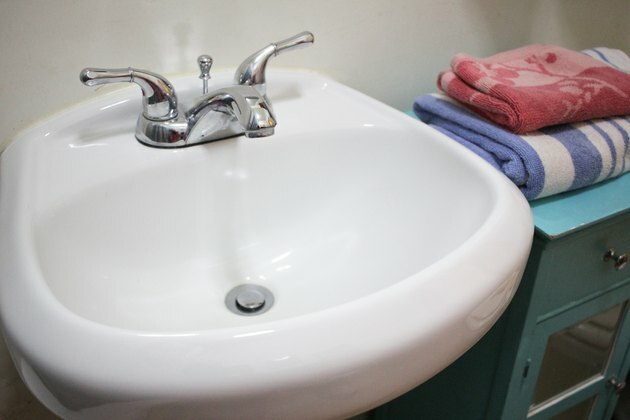 After you've done the basic cleaning -- or even between cleanings -- wipe down the sink with pure white vinegar applied with a sponge, or dilute it in running water to rinse the sink. Rub any areas that feel grimy or scummy with a nylon scrub pad. 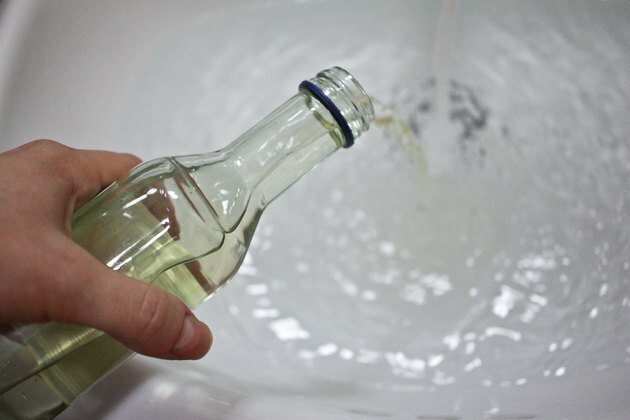 If the bottom of the sink bowl feels extra grimy, put the plug in the drain, and then pour in enough vinegar to fill it at least 1/8-inch deep. Allow the vinegar to run down the drain after 30 minutes or so. 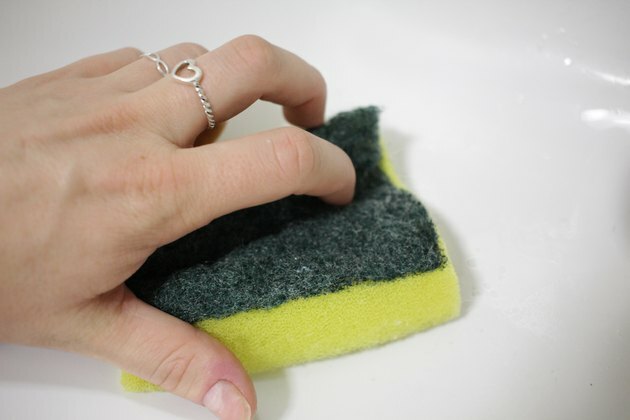 Then wipe down the sink bowl with a sponge or nylon scrub pad, and rinse the sink out. If your porcelain sink suffers from a rusty ring near the drain -- or any other buildup trapped near the drain, for that matter -- treat it with a bit of table salt and a slice of lemon. Wet the area, and then sprinkle salt liberally around the drain. Rub a lemon rind that still contains some of the lemon cut-side down over the salt, creating a rust- and scum-removing scrub that works especially well around drains. If your sink has a garbage disposal, place small pieces of the used lemon rind down the disposal to freshen the drain.